Maximum size: about 51 mm (Hoover, 2006). Identification: This species is elongate with low, irregularly-shaped clusters of smooth, conical pink tubercles on a black notum. The tubercles are usually simple and grouped in clusters with little or no black showing within the cluster. The mantle margin is edged in pale pink and the rhinophores are black. When seen underwater with the human eye, the animal may appear to have gray-green tubercles against a black background due to the absence of red light in deeper water. 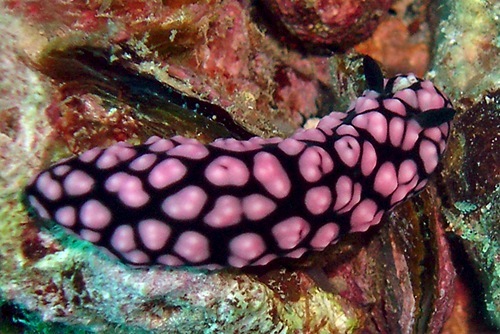 It can be distinguished from the rarely-seen Phyllidiopsis fissurata by its continuous pink marginal line and solid black rhinophores. Natural history: Phyllidiella pustulosa is commonly found in the open in rocky habitats. It lives in moderately protected to highly exposed areas at depths of 4-26 m (13-85 ft). It has been observed feeding on an orange encrusting sponge of the genus Stylinos. Distribution: Big Island, Maui, Lanai, Molokai, Oahu, Kauai, Niihau, French Frigate Shoals and Kure: widely distributed in the Indo-Pacific. Taxonomic notes: This is probably the species listed as Fryeria ruppelli Bergh, 1889b in Kay, 1979 and as Phyllidia pustulosa in Bertsch and Johnson, 1981. (Note 1) The name means "full of pustules" referring to the many pink tubercles. It is referred to as the "pustulose Phyllidia" in Hoover, 1998 & 2006. Photo: PF: Haloa Point, Maui; June 18, 2007. Note 1: The photo in Kay's Fig. 153 appears to show a typical P. pustulosa. However, her statement that the rhinophores are white is anomalous.